37in Panasonic OLED TV in the works? Are big-screen OLEDs the future of TV? The rumour mill for OLED tech just keeps on going. Now its Panasonic's turn to say "no comment" when asked about its manufacturing of 37in OLED TVs. 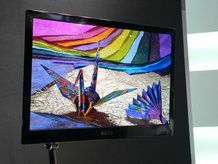 If the rumour turns out to be true, and Panasonic has confirmed that it is tinkering with OLED technology, then big, flexible screens will be available from the company as early as 2011. This, however, is not the biggest OLED TV being worked on at the moment. Last year we commented on a story that Samsung will be releasing a 42in OLED TV in 2010. This will be a full year before Panasonic's model hits shelves. Whatever happens, expect a barrage of energy efficient big tellys in the near future.